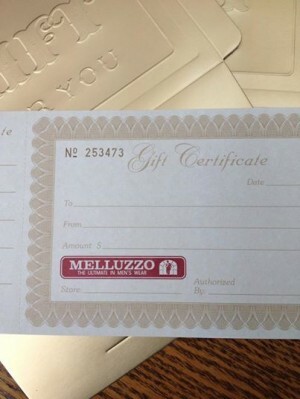 Melluzzo Menswear offers gift certificates in any denomination. Come get your special guy a Melluzzo menswear gift card for a Custom Suit, Custom Shirt, a great new pair of Agave Jeans or fashion shoes. Let our custom tailor and wardrobe consultant design a dress or sports shirt from the finest Italian fabric. Stop by our retail store or contact us to make an appointment for our unique door-to-door service.